Wild-type Ralstonia eutropha H16 produces polyhydroxybutyrate (PHB) as an intracellular carbon storage material during nutrient stress in the presence of excess carbon. In this study, the excess carbon was redirected in engineered strains from PHB storage to the production of isobutanol and 3-methyl-1-butanol (branched-chain higher alcohols). These branched-chain higher alcohols can directly substitute for fossil-based fuels and be employed within the current infrastructure. Various mutant strains of R. eutropha with isobutyraldehyde dehydrogenase activity, in combination with the overexpression of plasmid-borne, native branched-chain amino acid biosynthesis pathway genes and the overexpression of heterologous ketoisovalerate decarboxylase gene, were employed for the biosynthesis of isobutanol and 3-methyl-1-butanol. Production of these branched-chain alcohols was initiated during nitrogen or phosphorus limitation in the engineered R. eutropha. 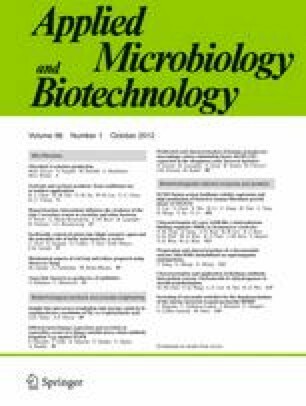 One mutant strain not only produced over 180 mg/L branched-chain alcohols in flask culture, but also was significantly more tolerant of isobutanol toxicity than wild-type R. eutropha. After the elimination of genes encoding three potential carbon sinks (ilvE, bkdAB, and aceE), the production titer improved to 270 mg/L isobutanol and 40 mg/L 3-methyl-1-butanol. Semicontinuous flask cultivation was utilized to minimize the toxicity caused by isobutanol while supplying cells with sufficient nutrients. Under this semicontinuous flask cultivation, the R. eutropha mutant grew and produced more than 14 g/L branched-chain alcohols over the duration of 50 days. These results demonstrate that R. eutropha carbon flux can be redirected from PHB to branched-chain alcohols and that engineered R. eutropha can be cultivated over prolonged periods of time for product biosynthesis. The online version of this article (doi: 10.1007/s00253-012-4320-9) contains supplementary material, which is available to authorized users. The authors thank Dr. Jens K. Plassmeier and Mr. Daan Speth for the helpful discussions; Mr. John W. Quimby and Dr. Qiang Fei for the critical review of this manuscript; and Ms. Amanda Bernardi for the assistance with R. eutropha isobutanol tolerance growth experiments. We also thank Professors Alexander Steinbüchel and Dieter Jendrossek for the generous gifts of the R. eutropha ADH mutant strains and Professor James Liao for the generous gift of the kivD gene. This work is funded by the US Department of Energy, Advanced Research Projects Agency—Energy (ARPA-E). We thank our ARPA-E collaborators Dr. Mark Worden and Ms. Yangmu Liu for their helpful discussions and support throughout the course of this study.